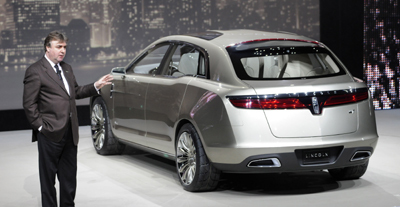 The Lincoln MKT Concept seems more like a platform for fuel-saving technologies than a potential production luxury vehicle. The second Ford product introduced at the 2008 Detroit Auto Show, the four-door "bustle back" features a rear hatchback design and the maker's new EcoBoost engine technology. EcoBoost, as Ford dubbed its family of high-efficiency engines, is offered as an alternative to hybrid drivetrains offered by other manufacturers. E85 capable, EcoBoost engines will feature direct-injection fuel delivery and turbocharging. The V6 in the MKT concept displaces 3.5-liters and is rated at 415 horsepower. Ford claims that when mated with a six-speed automatic transmission, the EcoBoost engine will use 20 percent less gas than a V8 producing the same horsepower. Lightweight composite body panels take the place of steel stampings and contribute to MKT's overall fuel thriftiness. Inside, MKT has "first-class cabin" accommodations including fully reclining bucket seating for four. Up front, vital vehicle information is projected onto a curved area of the center stack instead of displayed in a digital readout or on a video screen. 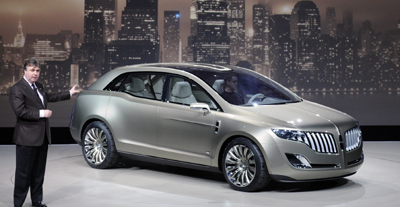 Though there are no immediate production plans for MKT, the concept could foreshadow a large Lincoln SUV based on Ford's upcoming Flex crossover. Expect such a vehicle to offer seating for up to seven passengers.